"Today a running Vega is a far less likely sight on America's roads than, say, a '55 Bel Air or '69 Camaro or even the scandal-plagued Corvair. Save for a bare few running with V8s on drag strips and a handful of limited-edition, twin-cam Cosworth models, the Vegas are practically all gone." For a 70's small car it's not bad looking. The nose isn't great, but much of that is due to the mandated 5 MPH bumper. (The early pre-5 MPH bumper cars had a nice, Camaro-like nose.) The rest of the body is clean and almost sleek, especially when compared to the Japanese station wagons of the day. (The fake woodgrain on this one really detracts from the looks of the car.) The interior doesn't look like a place you'd want to be for a very long time, but again, when compared to other small cars of the day, it's not bad. Looking at this car makes you realize just how badly GM's corporate dysfunction and greed screwed up what could have been a decent car. This car has just 3,957 miles on it. The seller says that the mileage is verifiable. He says it has every option GM offered except for cruise control. I can make a pretty good case for purchasing just about any old car. However, I can't give you a good reason to pay almost $10K for this car, unless you're opening a museum for bad engineering and corporate greed and you're looking for a pristine example of a car that represents both. I'm just pointing it out because it's so unusual to see a Vega still around and in this condition. Located in "Hammond / Hessville", IL, click here to see the Craigslist ad. I'm guessing no one will take a stab at writing about this gem, so I'll throw in my two cents. With less than 4000 miles on the clock, this car reminds me of those B movies where a caveman, who has spent eons frozen in ice, is suddenly reanimated by a bunch of well meaning scientists. A caveman will usually spend his first twenty minutes of post thaw freedom smashing glass beakers, chasing around some blond in a lab coat, and generally making a big mess of things. The moral of the story is that the personality flaws that were once locked in time, are going to be present years later. I'll bet if this car was exposed to any sort of humidity, or parked outside for any period of time, it would soon follow the innate path of the Vega species towards self destruction. 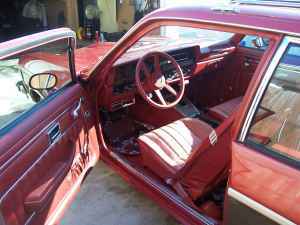 If I remember correctly, the Vega was one of those "rusted on the showroom floor" cars where owners found empty soda cans behind the door panels. I'm not sure where I'm going with this, but a couple of things are sure bets. First, this car would need to be garaged on a full time basis. Let me tell you a true story. Back in the mid 1990's, my parents had a MINT 1970 Vista Cruiser (455 with all the options) with less than 40,000 on the clock. It could have been less, but my memory has faded a bit. The bottom line is that except for errands on sunny days, it rarely left a heated garage. Dad took out an ad in Hemmings, and someone came up from New York to look at it. Unfortunately my father never sold anything in his life, so the guy walked. I guess the word "stunning" had yet to be invented. He then decided to give the car to a friend of his to sell. Unfortunately the car was left parked outside for a couple of summer months. I briefly saw it before it sold. The paint had cracked all over the body, and the faux wood side panels were peeling and faded. Rubbing compound would have proved useless. The Vista Cruiser had aged decades in just a short period of time. It's not the kind of car that triggers fond memories from the general public. If I'm cruising around a parking lot in a goofy car, I'd much rather prefer something that would put a smile on someones face, such as a Pacer, a Gremlin, or a VW Bug. Ebay tends to bring these kind of ultra low mileage cars out of the woodwork. The problem is that most of them are the less than desirable models (such as Hornets and Valiants) with steep prices. For example, there is a 1976 Pontiac Catalina up for auction right now with only 2,682 on the clock. 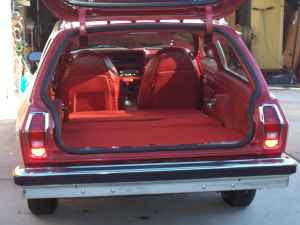 It is a four door "plain jane" model with a starting price of $9000. 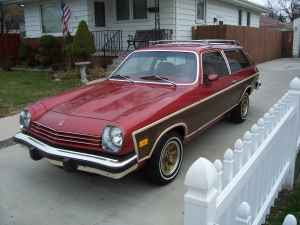 Heck, there is an overpriced 1974 Vega GT Kammback on ebay right now with 5,600 miles and it looks loads better than the 1977 woodie. Every now and then decent malaise era cars pop up for sale with reasonable prices.